One of the main difficulties artists face when they paint on location is the problem of seeing “correctly”. To see an object as it is and to reproduce that accurately is no easy task as we all know. Several difficulties immediately seem to jump out at us. First of all the object we are trying to paint is in three dimensions (length, width, and depth) and we are trying to paint onto a surface that only has two dimensions (length and width). We have a limited number of “tricks” we can use to try to capture the third dimension. Secondly the object we are looking at may not be stationary (a dog or a bird) or the object may have other external changes that challenge our skill (the sun may be going behind a cloud). 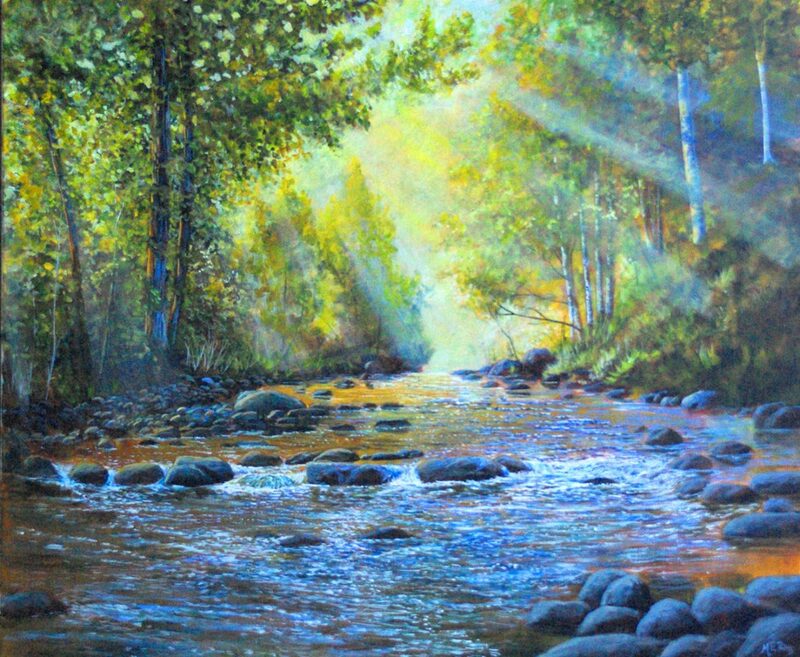 For example, suppose you are painting on location for several hours by a stream – during that time both the intensity and direction of the light may change drastically and the scene you finish painting may have little resemblance to the one you started with. All of this presents a real challenge but an even greater challenge is a philosophical one often rooted in Plato’s concept of the “universal”. I do not want to get too technical here but let me illustrate with a simple story. The tendency many artists face is that they switch into a kind of automatic mode when they see familiar objects. They look at a scene that has trees, for example, and they think to themselves: “I know how to paint trees” and they proceed to paint trees that have little or no connection to the trees they should be observing. We paint our “universal tree” not the specific tree we are observing. It is a bit of an over simplification, but Plato thought we recognize objects because we have in our mind a “universal tree” which enables us to recognize individual trees. When doing portraits from a photograph some artists find they are more accurate in reproducing the face if the photograph is upside down. Why? Because, it is argued, they have to paint what is there not what they think is there. One is forced to become more dependent on what you are observing. When I watch Richard Schmid paint I am always impressed by the intentionality and thoughtfulness of each stroke. The scene or portrait seems to come together quite quickly but there is great skill underlying this approach and an amazing economy of stroke.